AFTER HEARING ON 27.02.2013 CASE POSTPONED TO 28.02.2013.FINAL CAUSE LIST OF 28.02.2013 PUBLISHED .NEET CASE IS ITEM NO.3 IN COURT 1 .COURT WILL BE IN SESSION TILL 3 PM TOMORROW.UNAIDED INSTITUTIONS ARGUMENTS CONTINUED TODAY(27.02.2013).HOPEFULLY MCI LAWYER WILL START HIS ARGUMENTS ON 28.02.2013. UNAIDED INSTITUTIONS LAWYER MADE ARGUMENTS THAT NEET EXAM IS NOT VALID.HE WILL CONTINUE HIS ARGUMENTS TOMORROW. CASE POSTPONED TO MARCH 5TH . Todays case proceedings..state governments arguments over today.some private medical colleges arguments remaining..
NEET CASE TC(C)98/2012 LAST HEARING WAS ON 26.02.2013. AFTER CASE PROCEEDINGS ON 26.02.2013 CASE POSTPONED TO 27.02.2013.CAUSE LIST FOR 27.02.2013 PUBLISHED. NEET CASE IS ITEM NO.1 IN COURT 1 ON 27.02.2013 .UNAIDED INSTITUTIONS ARGUMENTS NOT OVER YET.WHEN UNAIDED INSTITUTIONS ARGUMENTS OVER MCI LAWYER WILL START ARGUMENTS .WE WILL UPDATE CASE UPDATES TOMORROW. 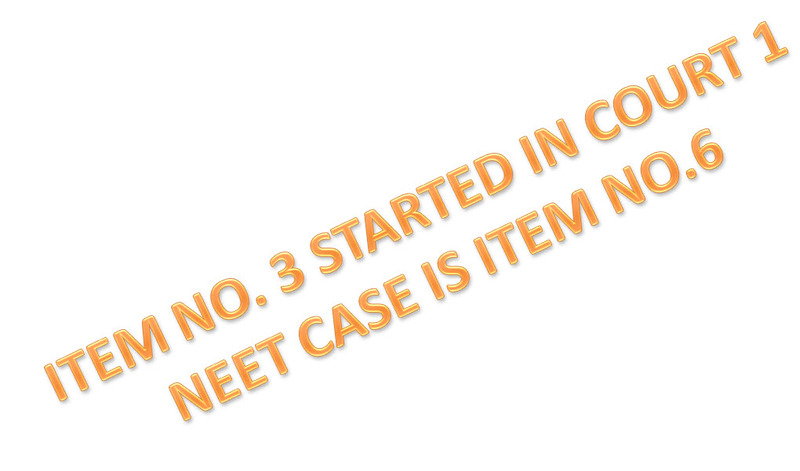 10.25 am TODAY NEET CASE IS ITEM NO 1 IN COURT 1.COURTS ARE NOW NOT IN SESSION .COURT 1 WILL BE IN SESSION BY 11 am.MOST PROBABLY NEET CASE WILL BE TAKEN TODAY BY 11.30 am .WE WILL UPDATE INFORMATION. 10.57 am NEET CASE STARTED IN COURT 1 . 11.30 am ITEM NO.24 IS GIVEN SPECIFIED TIME AT 2pm .BUT CASE IS FOR ORDERS SO NEET CASE WILL CONTINUE AFTER ITEM NO.24 AT 2pm.NOW NEET CASE IS GOING ON IN COURT 1.UNAIDED INSTITUTIONS ARGUMENTS NOW. 12.15pm NEET CASE GOING ON IN COURT 1 .MCI LAWYER WILL MOSTLY START HIS ARGUMENTS TODAY . YESTERDAY COURT HAD ASKED UNAIDED INSTITUTIONS LAWYER TO SUBMIT ALL HIS ARGUMENTS AS WRITTEN ARGUMENTS. 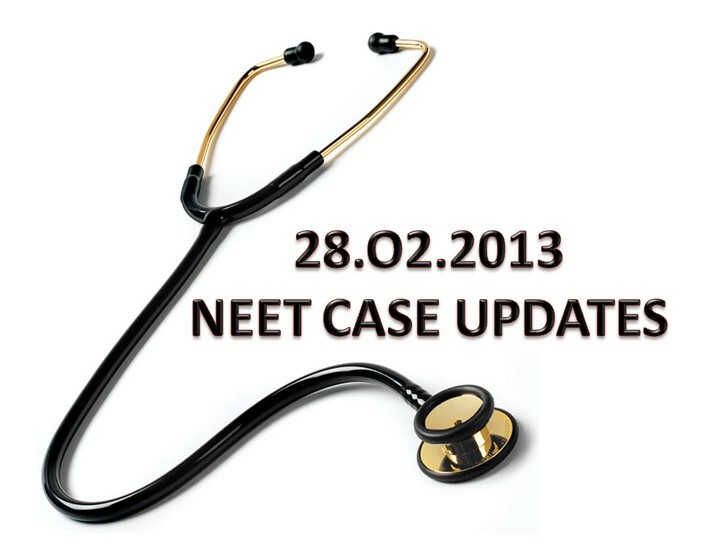 1.15pm NEET CASE CONTINUES.WE WILL UPDATE MORE INFORMATION ON NEET CASE SOON. CAUSE LIST OF FEB26 PUBLISHED NEET CASE IS ITEM NO 6 IN COURT 1.WE WILL UPDATE INFORMATION ON CASE DAY. LAST HEARING WAS ON FEBRUARY 21ST. 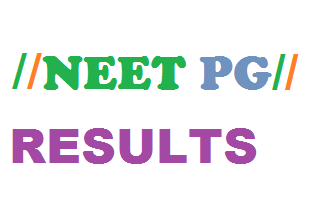 VIDEO ON NEET RESULT JUST FOR FUN!! 1TEM NO 27 TAKEN UP AFTER ITEM NO.5.SKIPPED NEET CASE. 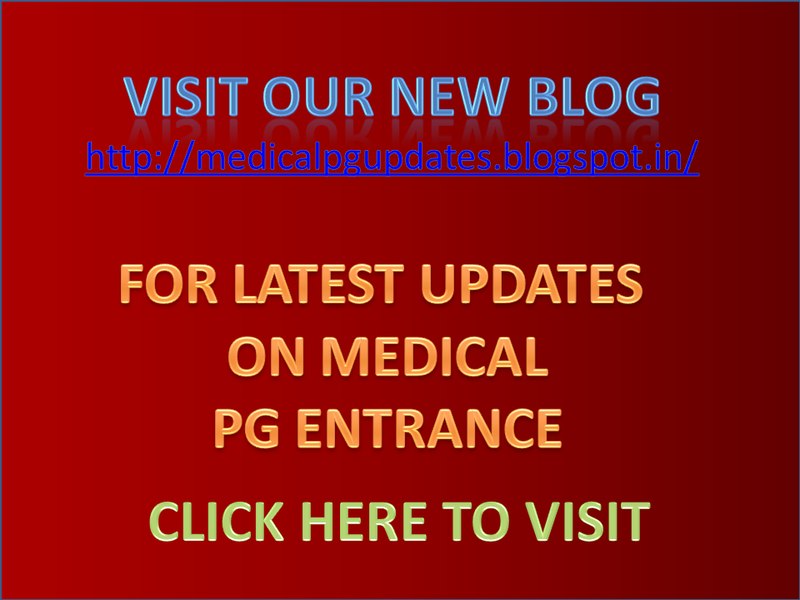 12.55 pm NEET CASE CONTINUES IN COURT 1.WAIT FOR MORE UPDATES.WE WILL INFORM YOU ON DETAILS AS EARLY AS POSSIBLE.ALL THOSE WHO HAD WRITTEN NEET PG MEDICAL ENTRANCE..PLEASE HAVE A CLOSE WATCH ON THIS WEEK CASE..ORDER FOR RELEASE OF RESULTS MAY BE GIVEN THIS WEEK. CASE POSTPONED ON 20.02.2013 TO 21.02.2013 .CAUSE LIST OF 21.02.2013 PUBLISHED .NEET CASE IS ITEM NO 2 IN COURT 1.COURT 1 WILL BE IN SESSION BY 11 AM TILL 3PM TOMORROW. 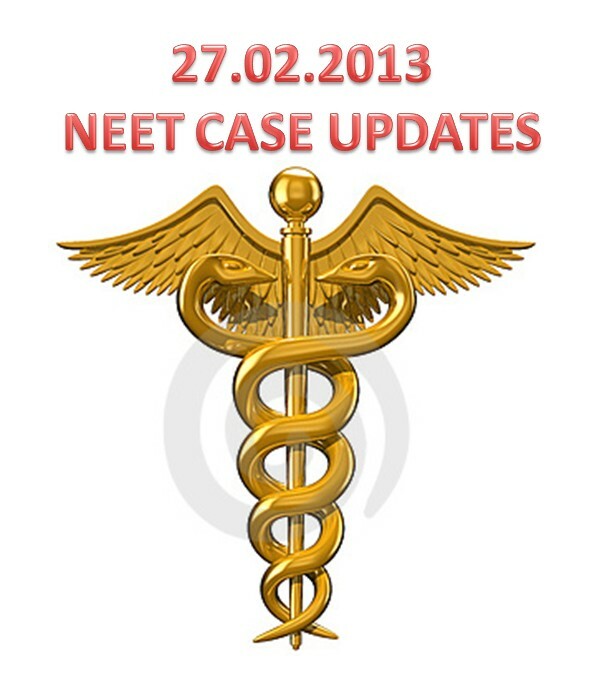 NEET CASE WAS POSTED ON 20.02.2013.BUT NOT TAKEN UP FOR HEARING.POSTPONED TO 21.02.2013.WE WILL UPDATE INFORMATION ON NEET CASE TOMORROW. MINORITY INSTITUTIONS ARGUMENTS OVER EARLIER NOW UNAIDED INSTITUTIONS ARGUMENTS ARE GOING ON.ARGUMENTS BY VARIOUS STATE GOVERNMENTS AND MEDICAL COLLEGES REMAINING.AFTER THIS MCI LAWYER WILL SPEAK FOR MCI.HE MAY ASK FOR ORDER FOR RELEASE OF NEET RESULTS.TODAY NEET CASE HAD STARTED BY 11 AM .SO THERE IS CHANCE FOR CASE TO GO ON TILL 3pm .IF COURT GIVE ORDER FOR RELEASE OF RESULTS THEN ONLY NEET RESULT CAN BE PUBLISHED.THOUSANDS OF DOCTORS HAD WRITTEN NEET PG MEDICAL ENTRANCE.DOCTORS ARE EAGERLY WAITING FOR NEET RESULT AND VERDICT SUPPORTING NEET. 1.40 pmNEET CASE GOING ON IN COURT 1. TODAY'S NEET CASE DISCUSSION OVER .WE WILL GET BACK YOU WITH DETAILS OF NEET CASE SOON. court display board showing item no.2 again.we will inform you whether case taken again or not at earliest. once we get the information. 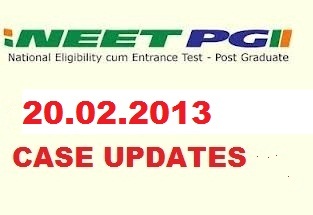 NEET CASE TC(C)98/2012 POSTPONED TO 20.2.2013.LAST DATE OF HEARING WAS ON 19.02.2013.CASE WAS NOT TAKEN FOR DISCUSSION ON 19 TH. 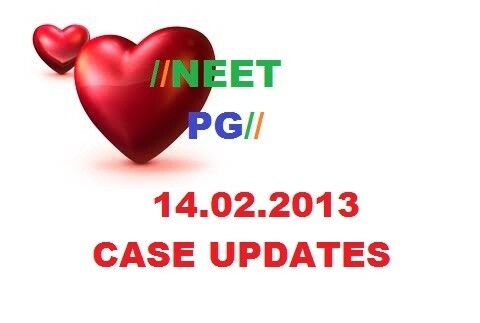 11.15 am item no.2 started.There is every probability for NEET case to be taken up for discussion today. NEET RESULTS WILL BE DECLARED ONLY IF VERDICT DECLARED OR AN INTERIM ORDER TO DECLARE RESULT IS GIVEN BY COURT .TILL ORDER IS GIVEN THERE IS STAY ON NEET RESULTS. MINORITY INSTITUTIONS ARGUMENT IS OVER EARLIER.TODAY ARGUMENTS BY UNAIDED INSTITUTIONS AND STATE GOVERNMENTS WILL BE THERE . 4 OR 5 HEARINGS MORE IS EXPECTED FOR CASE TO BE OVER.RESULTS WILL COME ONLY AFTER FINAL VERDICT .IF RESULTS HAVE TO COME BEFORE FINAL VERDICT INTERIM ORDER TO PUBLISH RESULTS HAVE TO BE GIVEN BY COURT. 4.15 pm NEET CASE NOT TAKEN FOR DISCUSSION TODAY NEXT DATE OF HEARING WILL BE INFORMED SOON. 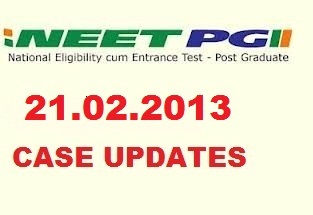 CAUSE LIST FOR 19.2.2013 PUBLISHED .NEET CASE IS ITEM NO.8 IN COURT 1.MORE DETAILS WILL BE PUBLISHED ON CASE DAY. 11.12 am item no 1 in court 1. 12.40 pm ITEM NO 1 STILL IN SESSION..
12.26pm ITEM NO.2 IN SESSION NOW.ONLY ITEM NO.7 REMAINING IN NUMERICAL ORDER .BUT CASES ARE NOT ALWAYS TAKEN IN ORDER..
2.25pm CASE 2 CONTINUES.COURT WILL BE IN SESSION TILL 3.30 pm .NOT MUCH CHANCE THERE FOR NEET CASE TO BE TAKEN TODAY. CASE POSTPONED TO TOMORROW 20.2.2013 TOMORROWS CAUSE LIST PUBLISHED .NEET CASE AS ITEM NO.4 IN COURT 1..
11.37 am NEET CASE STARTED.will update information on case later. 12.20 pm NEET case in court 1 court will be in session up to 3.30 pm . unaided institutions arguments now going on. 12.55 pm Still now NEET case is going on in court 1 .No verdict or interim order till now. 1.15 pm court display board showing not in session.lunch break ..
1.30 pm court now in session NEET case continues..
2.55 pm NEET case still arguments of minority institution and ap pg going on. NEET DISCUSSION IS OVER FOR TODAY .DETAILS WILL BE UPDATED SOON..
CASE NO. IS TC(C)98/2012 . 9.10 am NEET CASE IS CASE NO.I IN COURT 1.CASE IS EXPECTED TO START BY 11 AM ..UPDATES WILL BE PUBLISHED WHEN CASE STARTS..
10.00am COURT NOT IN SESSION.COURT IS EXPECTED TO BE IN SESSION BY 10.30-11AM .NEET CASE IS ITEM NUMBER I IN COURT 1.BUT COURT NOT ALWAYS TAKE THE CASES IN SEQUENTIAL ORDER .WE WILL REPORT ON THE CASE ONCE COURT IS IN SESSION .THOUSANDS OF PG ASPIRANTS ARE EAGERLY WAITING FOR RESULTS. JIPMER RESULTS WILL MOSTLY BE PUBLISHED WITH IN 2 DAYS.. DETAILS ABOUT NEET CASE WILL BE UPDATED EVERY 30min TOMORROW..
10.30 am no courts in session till now..
court 1 now in session .started with case no.31..NEET case is case no 5. 11.16 am CASE NO.3 STARTED NOW ..CASES MOVING FAST..
WE WILL UPDATE THE INFORMATION SOONER..WHEN WE GET MORE UPDATES. IN BETWEEN IF WE GET UPDATES WE WILL REPORT..
1.45pm NEET Case still continues. one more news paper reports interim order may be published today.It is a very famous news paper in kerala called mathrubhumi ..
Interim order not given by court... News on other case updates of today will be published later.Next date of hearing as well as updates on todays arguments will be published soon.. SO HEARING WILL BE CONTINUED TOMORROW..
THOUSANDS OF PG ASPIRANTS ARE AWAITING FOR NEET RESULTS..RALLY IS TO SUPPORT NEET BEFORE FINAL VERDICT EXPECTED BY FEB 15..
Today rally supporting NEET will be conducted all over India.Rally at Jantar Mantar will start by 11 am.Many PG aspirants,junior doctors,medical students will participate. Tomorrow there is NEET case in court..updates on Rally ,NEET case as well as results will be published in detail in this site. Court cause list for 12.2.2013 published.lot number of cases included in list..arguments by many medical colleges vs mci there in list . SAVEETHA INSTT.OF MEDICAL & TECH.SCI. DATTA MEGHE INSTT.OF MEDICAL SCI.& ORS. LAXMI MEMORIAL EDUCATION TRUST & ORS. HERE YOU CAN POST YOUR VIEWS AND DISCUSS ON NEET IN COMMENTS..
Today neet case number 5.bench sits only upto 3pm. Court no1 now in session..
NO CHANCE FOR FINAL VERDICT TODAY. AUTHORISED INFORMATION WILL BE UPDATED SOON..
NO CHANCE FOR NEET RESULTS THIS WEEK..